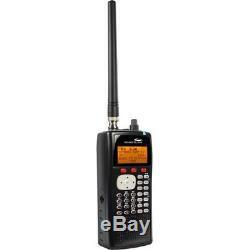 Whistler WS1040 Digital Handheld Scanner Radio. The WS1040 stores up to 1,800 frequencies and lets you search for nearby frequency transmissions and automatically jump to a found transmission. Plus, it lets you hear storm reports and more before they are broadcast on TV or radio. SYSTEM REQUIREMENTS: Only for use with Windows Operating System. Alert LED - Programmable multi-color LED can be configured to illuminate or flash when certain objects are active. Eight user-defined colors can be specified from thousands of possible combinations. Audible Alarms - Programmable audible alarms can be configured to sound when certain Scannable Objects are active. Can be used in conjunction with, or separately from, the Alert LED described above. Automatic Adaptive Digital Tracking - When monitoring P25 digital systems, instantly adapts the digital decoder to the digital modulation format of the transmitted signal, then analyzes the signal over 50 times each second and adapts to any subtle changes caused by multipath or fading. No cumbersome manual adjustments are required. Backlit Liquid Crystal Display - Easy to read and program data even in low light situations. Data Cloning - Allows transfer of the programmed data to another WS1010 scanner. Digital AGC - Instantly compensates for low user audio levels that are common on digital systems. Flexible Antenna with BNC Connector - Provides reception of strong local signals. Also connect an external antenna for improved reception of distant or weak signals. Free-Form Memory Organization - Allocation of memory dynamically and efficiently as it is needed. This differs from low cost and older scanners that had memory organized in rigid and wasteful memory banks. High Speed PC Interface - Use a USB Scanner programming cable for full duplex mode at 6 times the speed of previous scanner models for PC transfer and 8 times the speed of previous models for radio to radio cloning. High speed special USB to scanner programming cable included. Clones with another WS1040 handheld or with another WS1065 desktop/mobile scanner. Key Lock - Lock the scanner's keys to help prevent accidentally changing the scanner's programming. Lock-out Function - Skip over specified channels or frequencies when scanning or searching. LTR Home Repeater AutoMove - Takes the guesswork out of programming LTR trunking systems when the home repeater order is not known. Enter the LTR system frequencies in any order, and the WS-1040 will automatically move the frequencies to the proper home repeater slots as transmissions are received on the system. Memory Backup - Frequencies remain stored in memory for an extended time even without batteries. Menu Driven Programming with Context Sensitive Help - Each menu item provides a few lines of help text that provide assistance with programming and using the scanner. Multi-System Trunking - Scans most common trunked radio system signaling formats, including Motorola, EDACS, LTR and P25 trunked radio networks. Both talkgroup and individual call monitoring are supported. Object Oriented User Interface - Exclusive to Whistler, features common data entry, browsing and control methods are used for every scannable object. All are programmed and stored in the same way. The item "Whistler WS1040 Digital Handheld Scanner Radio" is in sale since Monday, January 18, 2016. This item is in the category "Consumer Electronics\Portable Audio & Headphones\Portable AM/FM Radios". The seller is "nothingbutsavings" and is located in United States. This item can be shipped to United States.